PETALING JAYA: The local retail sector is expected to face challenging times this year as consumers continue to be prudent in their spending while retailers have to face rising cost of goods and operation. 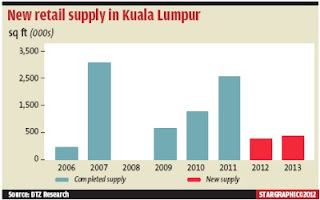 DTZ Research's Property Times on Kuala Lumpur's fourth quarter 2011 report said the situation would affect rental rates, occupancy and future rental growth. Despite a marginal decline in the occupancy rate, Property Times said major developers were still optimistic and went ahead with a number of new retail projects. The report revealed that new retail projects expected to be completed in the Klang Valley this year included Nu Sentral, Kuala Lumpur, with net lettable area of 700,000 sq ft; The Paradigm, Kelana Jaya (500,000 sq ft), Setia Alam Mall, Shah Alam (700,000 sq ft); and KL International Airport 2 (350,000 sq ft). Those slated for completion in 2013 include IOI City Mall Putrajaya, Putrajaya (1.3 million sq ft); Sunway Velocity, Kuala Lumpur (800,000 sq ft); and The Strand Mall, Kota Damansara (300,000 sq ft). Other future projects comprise the extension project of Suria KLCC by KLCC Property Holdings Bhd comprising a new 300,000 sq ft retail mall that will be integrated to the mall. Suria KLCC recently saw an extension of 140,000 sq ft in net lettable area. The Naza group will also be developing two retail centres with over two million sq ft of retail space which will be part of its RM15bil KL Metropolis development at Jalan Duta. Meanwhile, Pavilion REIT plans to add another 300,000 sq ft to its existing Pavilion shopping mall in Kuala Lumpur. Property Times said one of the latest retail mall opening was that of KL Festival City Mall with approximately 450,000 sq ft of retail space that was completed in the fourth quarter of last year. “With the completion of the mall and six others in the previous quarters, the retail stock in Kuala Lumpur now stands at 23.7 million sq ft, an increase of 7.4% from the preceding year,” the report said. It said during the period under review, retail centres in Kuala Lumpur recorded a slight decrease in average occupancy rate by 0.3 percentage point on a quarter-on-quarter basis and 1.3 percentage points to 90.7% on year-on-year basis. Meanwhile, retail centres outside of Kuala Lumpur saw a decline of 1.1 percentage points quarter-on-quarter and 0.1 percentage point year-on-year in occupancy rate to 86.9%. The decline was largely due to slow leasing rate in the newly-completed centres, it added. The Knight Frank report said the three new shopping centres expected to open during the first half of this year Setia Walk in Puchong; Setia City Mall in Shah Alam; and Paradigm Mall in Petaling Jaya would add another 1.7 million sq ft to the existing retail stock in the Klang Valley. During the second half year of 2011, there were eight retail property completions that added a total of 2.88 million sq ft of space to the market. “The total cumulative figure for existing supply of retail space in the Klang Valley now stands at approximately 43 million sq ft,” the report added. The new completions were that of Publika Mall @ Solaris Dutamas, 1 Shamelin, Kenanga Wholesale City, Southgate, Mines 2, KL Festival City, First Subang and Space U8. There was one closure recorded during the period, namely Atria Shopping Centre, in Damansara Jaya. The 29-year-old mall, owned by OSK Property Holdings Bhd, will be redeveloped over four years into a new 450,000 sq ft mall and two 16-storey towers of SoFo Suites.